For the last two editions of the magazine we mainly focused on the development of Mad Studies, and several contributors now respond to that theme. We do hope to continue these discussions, but this time there is no distinct thread to the contents. This is because we also want to ensure that we cover a range of topics relevant to our diverse readership, especially our loyal supporters from the user/survivor movement. Andrew Roberts from the Survivors History Group raises some of these issues on our letters page. 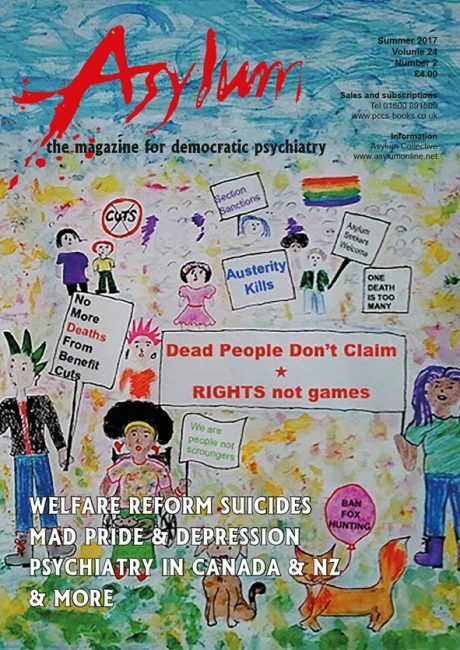 Suffice to say, we remain the magazine for democratic psychiatry (not Mad Studies… ). We always welcome contributions, whatever the topic or point of view, so if you have ideas or opinions you would like to share, don’t be shy in coming forward! We are pleased to have an international section this time, reporting on the state of the mental health services in Canada and New Zealand. We hope that future issues will include reports from our conference in Manchester, Asylum: Action to Reaction, to be held at the end of June. If you are interested in attending, see the advert below for details. Meanwhile, it is clear that our Government is determined to demonise the distressed and disabled, making life as hard as it can for them, no matter what the human costs – after all, few of them are ever likely to vote Conservative. The human costs are high and rising, with the yearly number of suicides now increasing again, and we are pleased to report examples of resistance that are rarely featured in the mainstream media. Come to the Asylum conference – Action and Reaction – on 28 June in Manchester. Only £10 for subscribers!